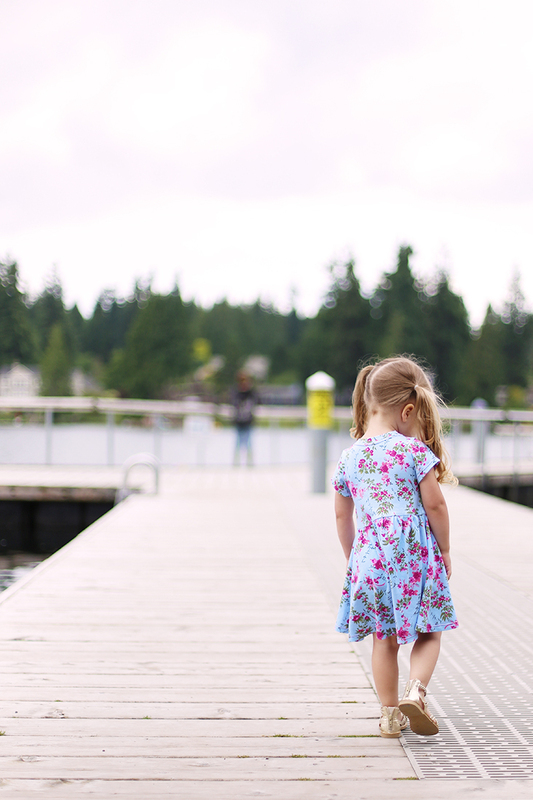 What little girl doesn’t love running around all summer in playdresses? I know mine surely do. 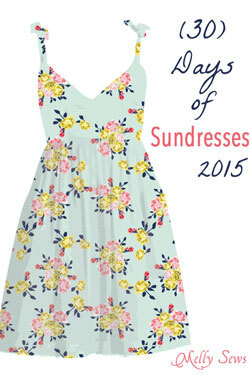 Today I’m joining in with Melly Sews 30 Days of Sundresses and sharing a Free Girl’s Knit Dress Pattern! After participating last year as well, I was more than excited to join in again! 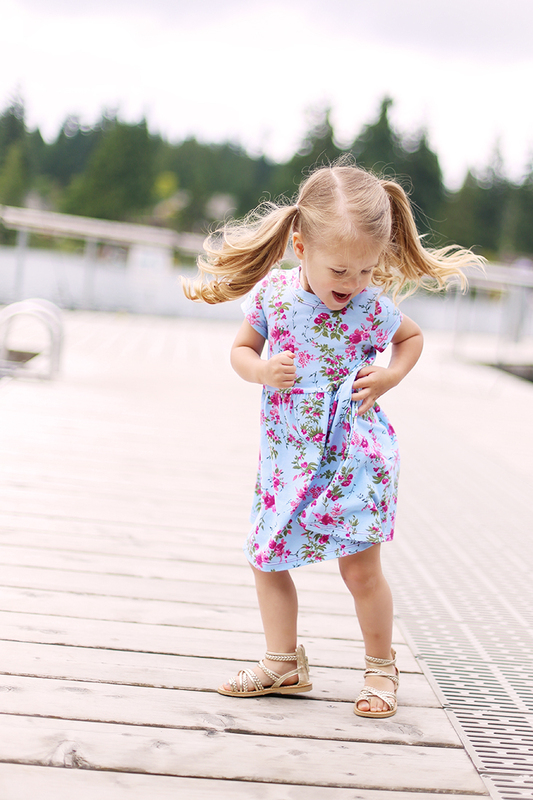 Along with all of the adorable dresses, there’s also a fun giveaway over at Melly Sews, so be sure to head over here and enter. It’s crazy how fast kids change when they’re little, I can’t believe how much Lola has grown (and I also had a chuckle about the similarities from last year to this year, between the shoes, fabric choice, and her hairdo). 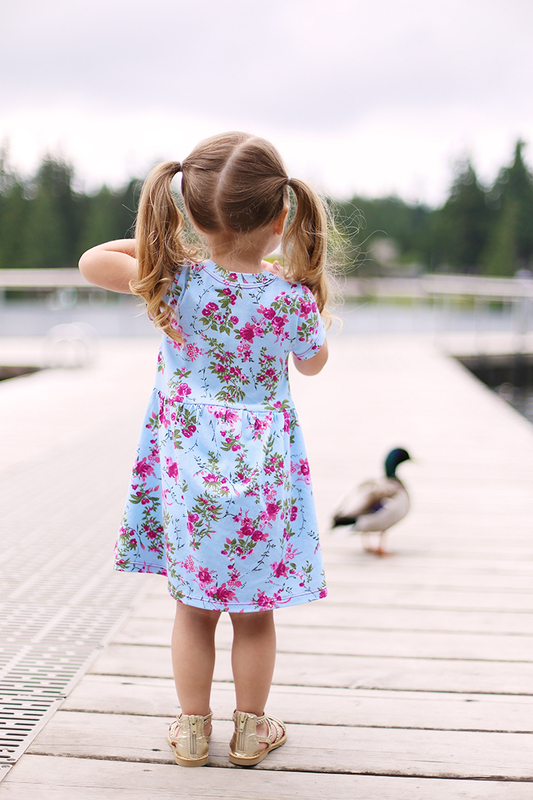 The Suncadia Dress Free Pattern is sized for 3T, or chest measurement of 21″. 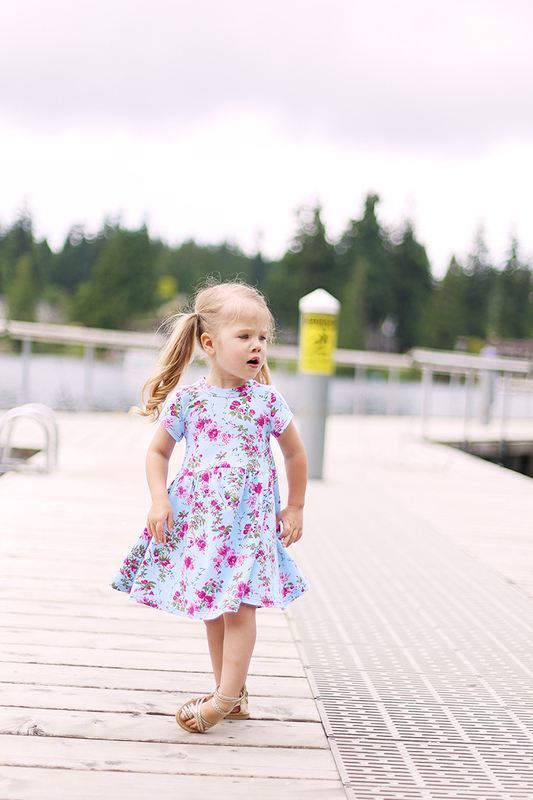 Since Lola is small for her age, I adjusted the width and length for her on the dress she’s wearing in these photos, but the unaltered pattern that you can download below is sized for an average 3 year old. Lola loves to wear dresses, and it makes my life sooo much easier if she has a drawer full of them to wear. My plan is to make a few more so that they can keep both of us happy all summer long. It’s comfy enough to wear at the park or over a swimsuit, but can still be dressed up a bit as well, which I love the versatility of. 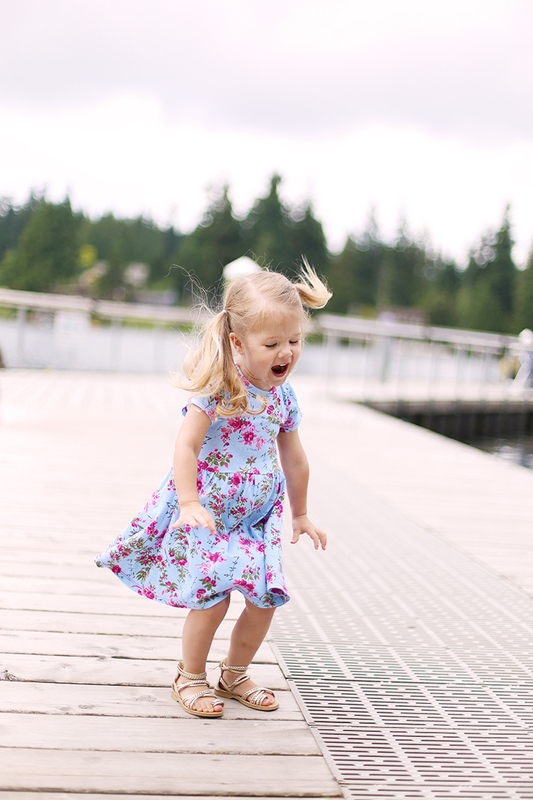 Lola has tested her new dress out quite thoroughly already ;), and I’m happy to say that she loves it! I hope your own little girls will love it as much as she does! Click HERE to download the FREE pattern. Print at 100%, with no scaling, and check the test square on page 1 to ensure printing accuracy. 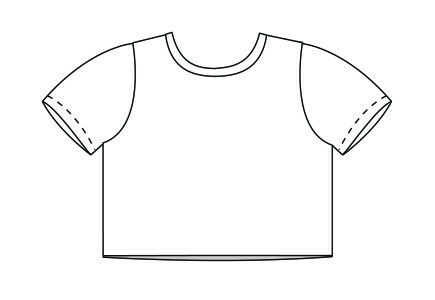 After taping the pattern pages together, matching markings, cut pieces out as illustrated below. 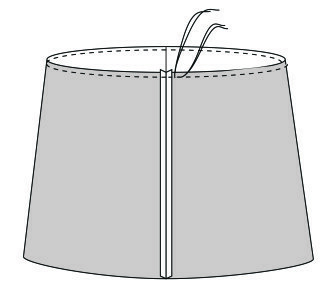 If using a regular machine, use a long and narrow zig zag stitch to allow stretch in the seams. 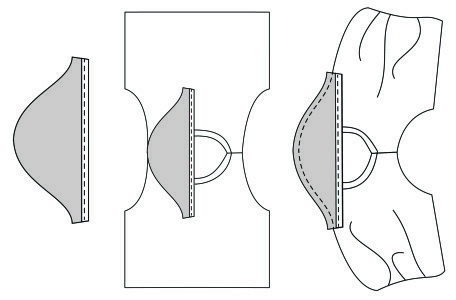 Press seam allowances open whenever possible. If using serger, press seam allowances in opposing directions (ex. 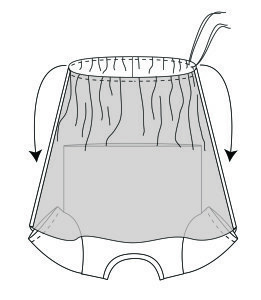 on bodice toward back and skirt toward front) to reduce bulk at waistline, and shoulder seam allowances toward back. 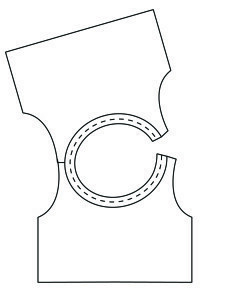 Right sides together (RST), stitch bodice front to bodice back along one shoulder. Press seam open. WRONG sides together, press neckband in half lengthwise. RST, pin and stitch raw edges of neckband to neckline of bodice, stretching neckband to fit neckline of bodice. 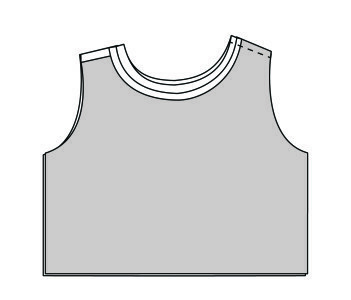 Press neckband away from bodice, with seam allowance toward bodice. 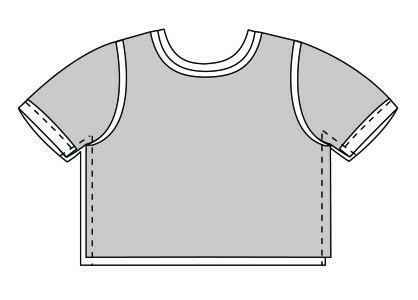 Optional: Topstitch through bodice and seam allowance bodice, close to neckband. If using zig zag stitch, you may want to increase the width/length slightly to allow extra stretch for the neckline to fit over the head. It’s a good idea to test that it will fit easily over the head before moving on to the next step :). RST, stitch remaining bodice front and bodice back shoulders together, matching raw edges. Press bottom of each sleeve 1/2″ toward wrong side. 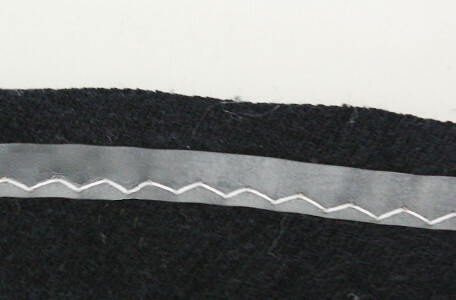 Topstitch 1/2″ from each folded edge using zig zag stitch, twin needle, or coverstitch. Mark center top of sleeve caps by folding sleeves in half. RST, pin and stitch each sleeve to each armhole, stretching armhole to fit sleeve. RST, pin and stitch bodice and sleeve side on each side, matching raw edges, from sleeve hem to bottom of bodice. RST, pin and stitch skirt together along each side, matching raw edges. 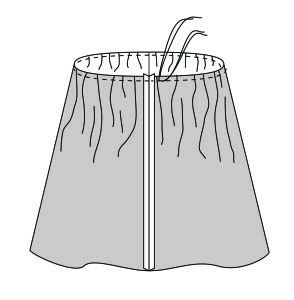 Using a basting or gathering stitch (longest stitch on your machine), stitch around entire top of skirt. Do not backstitch at beginning or end of stitches, and leave thread ends long. Pulling on bottom threads only, gather top of skirt to fit bottom of bodice. 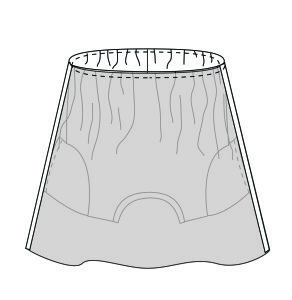 RST, place bodice inside of skirt and pin top of skirt to bottom of bodice, matching side seams and notches, and evenly distributing gathers. Stitch along pinned edge, stitching clear 1/4″wide elastic into the seam at the same time. The clear elastic will give stability to the waistline, while still allowing it to stretch. Remove basting stitches with seam ripper and press. 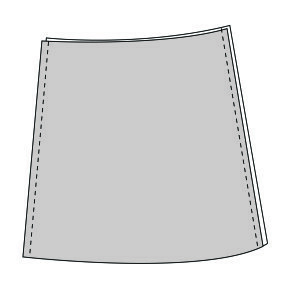 Press skirt hem 1″ (try the dress on and adjust length as needed) toward wrong side and stitch close to raw edge using zig zag stitch, twin needle, or coverstitch. Hope you all have a fun summer filled with lots of everything that you love! The dress is darling, so is your daughter. Love this fabric. Aw, thanks Jenya! I just made myself a shirt out of the fabric today, I love it too! 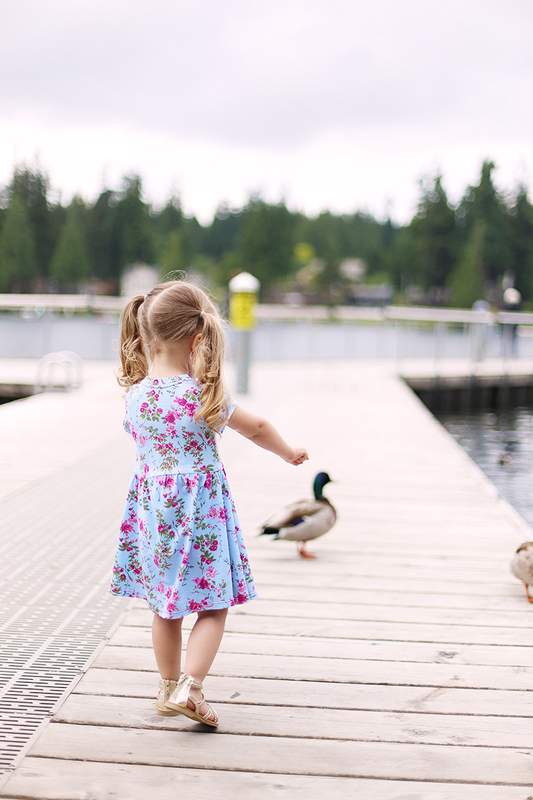 Darling girl, pictures, and dress! Love the fabric and great illustrations! 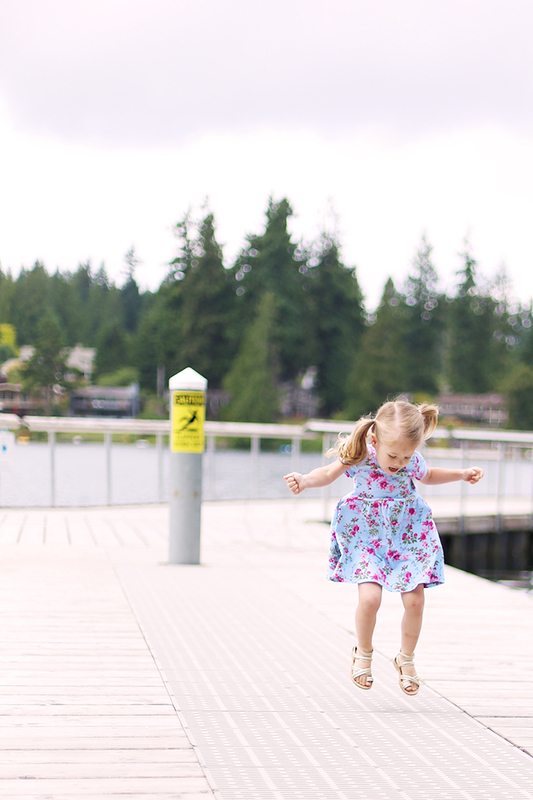 This is such a fun pattern and I love the pictures of your daughter in this dress! Makes me want to sew, sew, sew! Thank you, Linda! She definitely did not stop moving during the entire photoshoot! I let her do her thing and just click away, lol. Haha, I can’t say I blame them ;). Thanks for stopping by, Molly! SUPER CUTE!!! And, a special niece is about to be THREE!!! Perfect timing…. Aw, thanks! Hope she gets one ;). The dress is amazing. thanks for sharing. I can’t wait to make one. I seriously love everything about this dress! Hi Abbie! I haven’t graded this pattern to larger or smaller sizes yet, but it’s on my list for the future – I’ll be sure to post here when it’s ready! It unfortunately isn’t yet, sorry! Any update on the availability of this to purchase in other sizes? Is it still something you are planning on selling? If so, do you have a timescale as I would love to buy it. Hi! Unfortunately I haven’t graded this into other sizes yet. It’s still a possibility, but probably not in the near future. Thanks for asking!! 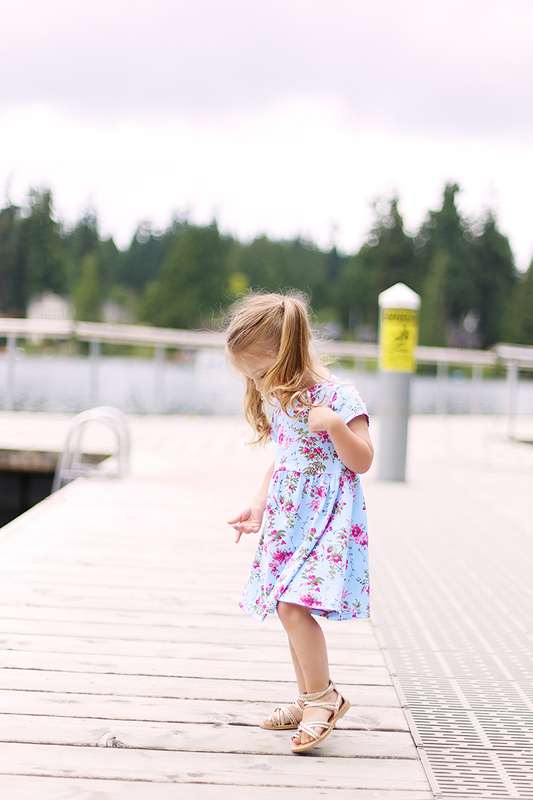 Thank you for sharing this cute little dress pattern. I can’t wait to make some dresses for my grand-daughter, who is turning a year old, but will be growing into it soon enough. 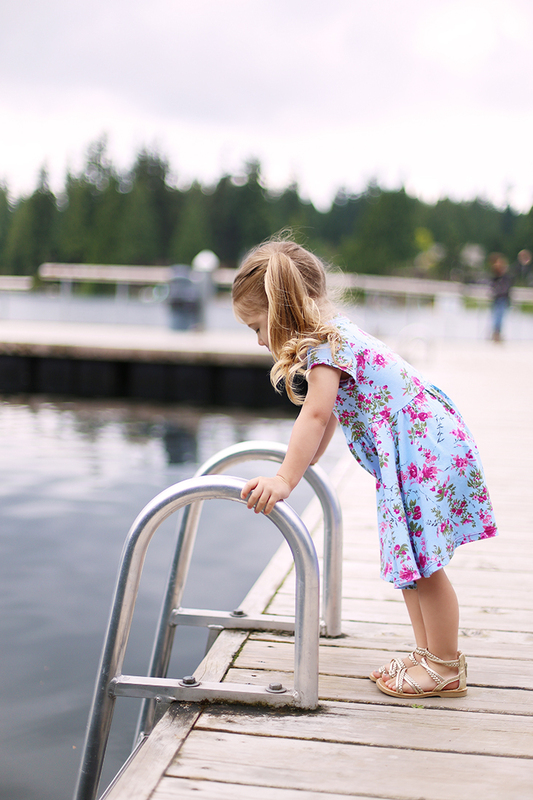 Your little daughter is adorable, and the dress looks so cute on her. I can tell she is very active!! 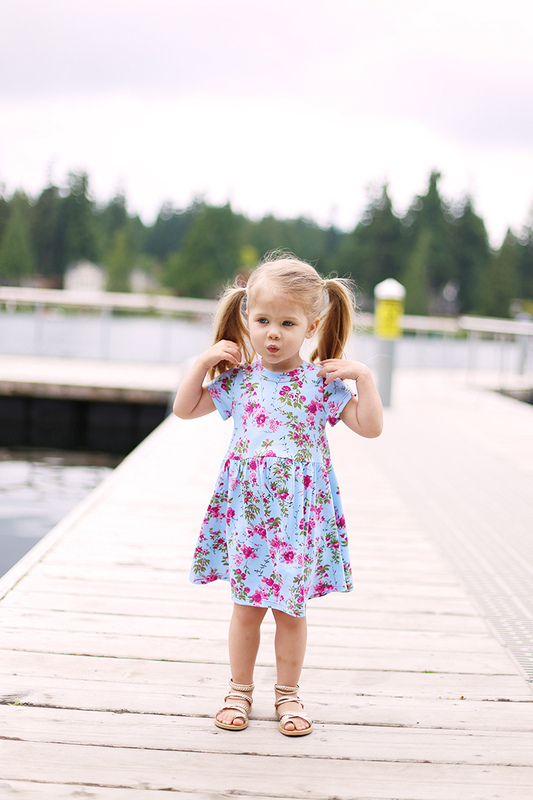 Thank you for creating a cute dress and an accurate pattern! I sewed one in a navy blue jersey fabric. My kiddo loved how well the full skirt spun around when she twirled. I loved how accurate the pattern was. Even the neck binding was exactly the right length. Kudos to the author/designer. Thank you, thank you! Thanks so much, Alyx! So glad you enjoyed the pattern! First of all thank you for sharing this darling pattern! I love it!! I am having a bit of a problem with fabric quantity though. I just washed and dried my 3/4 yd 60″ wide knit fabric. I have no shrinkage. I printed up the pattern and my 1″ test square is spot on. 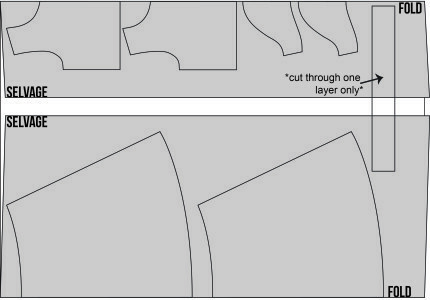 The problem I am having is the cutting layout. 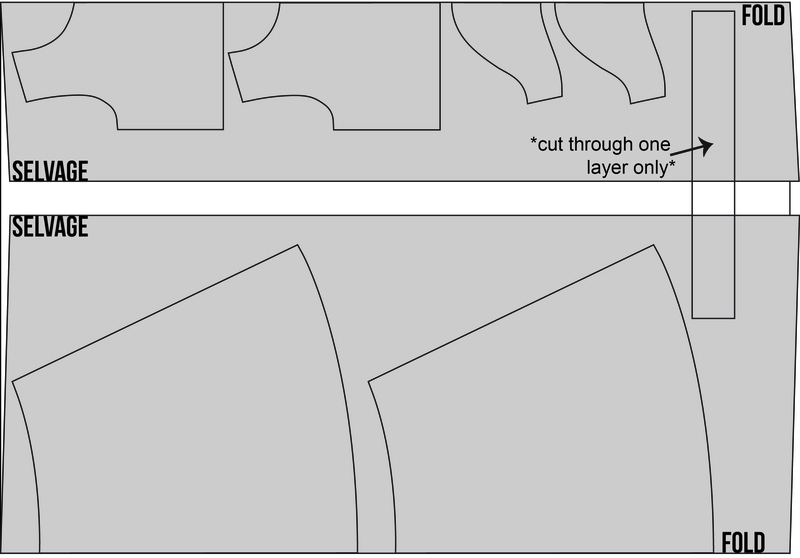 If I put the selvages the way you have it in the diagram I only have enough fabric to cut out one skirt piece on fold, bodice, back, and sleeves. There is not enough fabric in a 3/4 yd piece to cut out two skirts and collar! Am I doing something wrong. I have it folded with selveges meeting just like your diagram. I am so confused. Is it possible that 3/4 yd is not the right amount? and reorienting the fabric so the cut edges meet obviously doesnt work either. help! Hi Lisa! Thanks so much for commenting and I’m so sorry you had troubles with the fabric amount. I double checked the fabric layout, and you are correct! A full yard is needed to fit all of the pieces, and so I recommend 1 1/4yd to allow for shrinkage. I’ve updated the post with the correct amount, and appreciate you noticing that so that others don’t have the same trouble. We recently updated some other things with this tutorial and I wonder if that perhaps was changed in error. Thanks again! Lovely pattern, just the sort of thing we were looking for, thank you! I’m newly returned to sewing (a grand-daughter will do that to you) and online pattern printing is a new thing for me, but since my grand-daughter is 14 mos old I experimented by printing this dress pattern off at 85% instead of 100% and tweaking a few things (keeping the width on the neckband and the length of the sleeves) – I’m making an experimental dress with inexpensive cotton knit, so we’ll see, but it’s almost done and so far it’s looking really good. 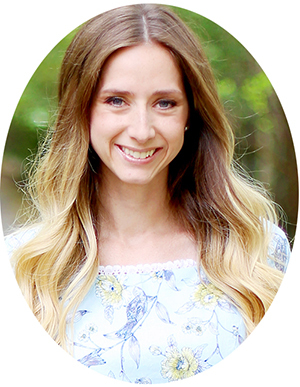 Thoughts about this re-sizing strategy? Hi Deb! Because the sizes of a pattern do not normally change evenly across every point, grading by reducing the overall size usually does not produce the correct size. BUT knit will definitely be more forgiving that cotton due to the stretch, so that will be on your side :). Thanks for the feedback! I agree re the knits, they’re pretty amazing. I did tweak a few things after a visual assessment of the proportions, but so far I’ve made a dress at 85% which fits with little room for growth, and now another one at 90%. It’s worked, although if the pattern had been available in the different sizes that would be my first choice. 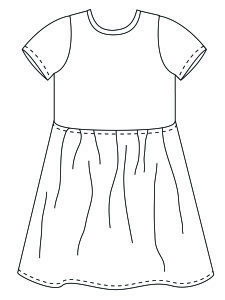 Lovely little dress pattern and really easy to make! Thanx for sharing this pattern, I love it! I probably should comment about the pattern but the little girl in the pictures is so adorable!!!!! Her spirit and attitude in the pictures are fantastic! Any plans to grade this out to other sizes? I love this pattern! I’ve made 4 of them in the last week, and it is exactly what I was looking for! Fits my girl perfectly right now, but I would love to make some for her to grow into, or to give away. I would buy the multi sized pattern the minute I find out it’s available! That is so great to hear, Cara! It’s not in my immediate plans, but is for sure on my list for the future to make more sizes. So glad you’ve been able to use the free pattern lots! I have made three of these dresses for my granddaughter and she loves them. They are fast and easy to make and so incredibly cute! Thanks so much for sharing the pattern. If I want to make this dress for her next year when she is a little bigger, would I just add some width to the bodice and skirt? 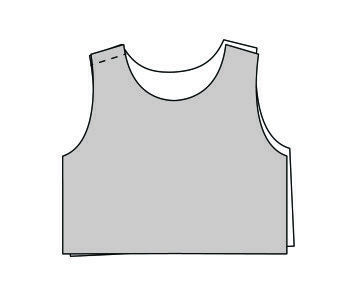 Maybe make the sleeve cap and shoulder to armpit piece longer? Hi Teresa! Knit dresses will definitely be more forgiving grading to a larger size than a woven design would, so you could give what you mentioned a try. I’d recommend making a muslin before cutting into your good fabric though!